A shot reverberates across the plains of central Texas as the first test firing of a fully 3D-printed gun goes off. Cody Wilson is the founder of Defense Distributed, a company leading the way in 3D-printed firearm technology. 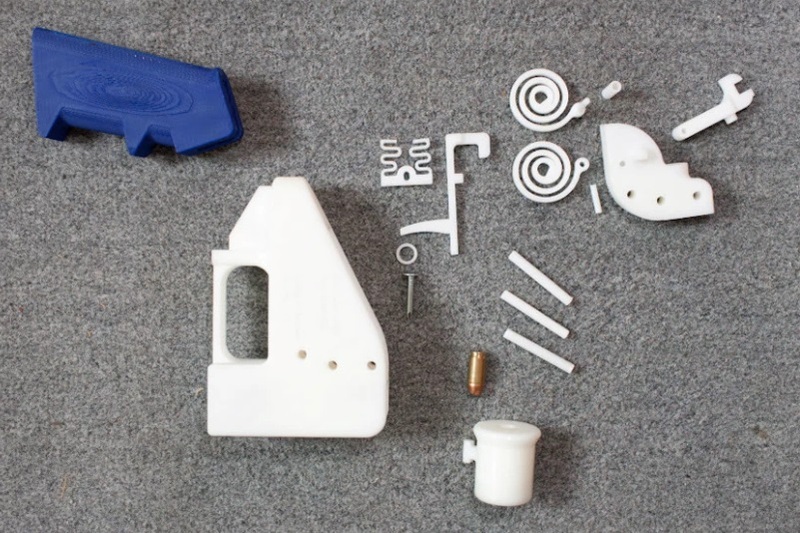 The company even has a free blueprint which it plans to release on its website in August so that anyone can 3D print the gun. But what does this gun feel like to shoot and could it explode? Wilson's first fully 3D-printed handgun fires a .380 caliber bullet. Wilson and his partner John created the gun and are calling it "the Liberator". The name is a homage to the cheap, one-shot pistols designed to be air-dropped by allies over France during its Nazi occupation during World War II. This Liberator isn't like its steel predecessor, Wilson's weapon is almost entirely made of plastic. In fact, the Liberator is made from 16 pieces, 15 of which are plastic and created inside an $8,000 Stratasys Dimension SST 3D printer which he bought used. This 3D printer lays down threads of melted polymer that add up to precisely-shaped solid objects as it cools. Just like a traditional computer prints ink on a flat surface, a 3D printer virtually slices the object it will print into paper-thin sections inside its computer and then prints out those slices one at a time until they create a 3D object. Wilson created Defense Distributed to provide a firearm that anyone could make using a 3D printer. "You can print a lethal device. It’s kind of scary, but that’s what we’re aiming to show," Wilson said. "Anywhere there's a computer and an Internet connection, there would be the promise of a gun." Since it is made of a plastic polymer, the Liberator is lighter than a normal handgun its size made of metal. Although, there are a few parts made of metal such as the firing pin that strikes the bullet and ignites the powder which in this case happens to be a nail. Because of a legal issue, there is a requirement for a steel block inside but it provides no purpose. Those two are the only metal parts in the entire gun yet it is safe to fire, effective, and above all else, cheap. To see more about how the Liberator works here is an animation that breaks down each part and how it works. August 8, the website DEFCAD will be offering a number of brand new 3D files of guns. Details have yet to be released, but numerous designs are already teased. Once the Federal Courts ruled the AR design was NOT owned by the DOD or the US Gov. last week it became a scramble for the Democrats to write a bill requiring 3d Printers be registered.. They do it in England and other countries now? Finally, now all of the computer geek videogame-playing anime-watching sissyboys can save their mothers some money, and kill themselves without having to walk away from their faggotboy computers. First, you said, "the Liberator is made from 16 pieces, 15 of which are plastic", then you said "there are a few parts made from metal" (the word FEW means three) then, you said there are only TWO metal parts. You can't seem to figure out what you're trying to say here. Is it One metal part, Two or Three? THIS IS WHAT HAPPENS WHEN SOMEBODY WITHOUT A COLLEGE DEGREE BECOMES A 'NEWS REPORTER'. In May 2013, the US Govt took down all of Cody Wilson's online templates, and now that he has begun making them available again, he is under investigation, and will soon be arrested on federal charges of conspiracy. Anyone who downloads the designs will also become part of the federal investigation, and could actually face life in prison. There is no federal law prohibiting a law abiding citizen from manufacturing firearms for personal use as long as a few rules are followed, like firing from a closed bolt, semi automatic or single shot, bore size ect. This pistol could be trouble just because of the smooth bore but design some rifling into the bore and it should be good till the 1st shot.